So by now we all know that we should be using social media for our businesses right? And hopefully you know how to engage with your audiences across Twitter, Facebook, Google Plus and Pinterest. But do you know how to measure the results of your activity on these social media channels? Well if not, here’s a quick overview of the social media analytics that are available and how you can access them. You can see detailed reports on the number of impressions that your tweets receive, the level of engagement with your followers and some interesting stats on your follower demographics, all by visiting analytics.twitter.com You simply need to be logged in to the Twitter account that you want to view the analytics for. 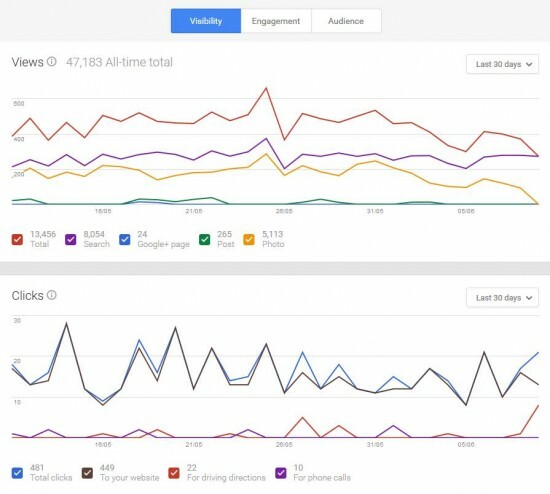 Your results on impressions and engagements can be filtered by different time periods, which is great if you need to include a summary of results in a report. A recently added homepage dashboard in Twitter Analytics also gives you monthly highlights detailing your top tweet (the one that received the most impressions), your top mention, your top follower and your top card tweet (if you don’t know about Twitter cards, check out the advice on their Twitter Cards developer page and start implementing the code in your site!). When logged in to Facebook with any account that has the appropriate permissions for your Facebook Page, on the page itself you will see an ‘Insights’ tab, just under the main blue navigation bar. This is where all of your page analytics live – here you will find statistics on the number of users that like your page, the reach of your posts and the levels of engagement with your posts. If you’re anything like me, you probably still think of Google Plus and Google Places as two separate things. Of course, they aren’t anymore, and instead we have ‘Google My Business’. This means that accessing your Google Plus analytics is via the ‘My Business’ section. Once there, you’ll see the ‘Insights’ section which gives you a brief overview of your statistics and a link to view them in more detail. On the details page there are tabs to view stats relating to Visibility, Engagement and Audience. Each graph has an option to filter the date range that you are looking at and tick boxes below the graph to switch on or off different statistics. In a similar way to Twitter, when you’re logged into your business Pinterest account, you can visit analytics.pinterest.com to access stats on your pins, repins, clicks and demographics of your audience. With all of this data available to review and analyse, don’t forget to also refer back to your Google Analytics! There’s a whole section within the Acquisition menu that is now dedicated to social media.